Looking for news, video and media about the films? Check the Caribbean Trading Company from FilmEdge.net! So yer a movie buff, aye? Get the critics' views of the POTC films with the collected reviews found at RottenTomatoes.com. 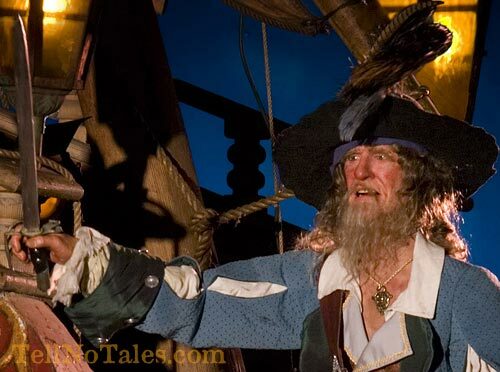 You don't want to miss the official Disney Pirates page... and you can turn yourself into a pirate on the POTC myspace page! The Sparrow has landed... in the Pirates attractions! The ride that inspired the films has now been enhanced by them! ANAHIEM, CAPirates of the Caribbean, the popular Disney theme park attraction brought to the big screen in Disney's Pirates of the Caribbean: The Curse of the Black Pearl, welcomed new characters and elements today from the blockbuster entertainment franchise as part of a spectacular, star-studded world premiere for Pirates of the Caribbean: Dead Man's Chest at Disneyland in Southern California. The attraction officially re-opened to guests at Disneyland on June 26 and in Florida's Magic Kingdom on July 7. The crafty Captain Jack Sparrow, his ruthless and cunning nemesis Barbossa, and Davy Jones, the legendary ruler of the ocean depths, have joined the "Wildest crew to ever sack the Spanish Main" in the classic Disney Park adventure at both the Disneyland Resort in California and Walt Disney World Resort in Florida. The enhanced attraction opens in time for the highly anticipated major motion picture release of Pirates of the Caribbean: Dead Man's Chest, in theaters nationwide on July 7. Additionally, in late June of 2006, guests sailing on a Disney Cruise Line vacation found a 175-foot ghost ship, The Flying Dutchman, anchored at Disney's private island Castaway Cay. The actual movie set piece from the new film provides the perfect setting and an incredible backdrop for would-be pirates. "Bringing these popular characters from the 'Pirates of the Caribbean' film franchise to Disneyland and Walt Disney World is a great example of how we are bringing new magic to a classic attraction," said Jay Rasulo, chairman of Walt Disney Parks and Resorts. "Our parks are where the Disney magic comes alive, and we're excited to give Captain Jack Sparrow and his cohorts a home in our Pirates of the Caribbean attractions and on Castaway Cay  much to the delight of our guests." 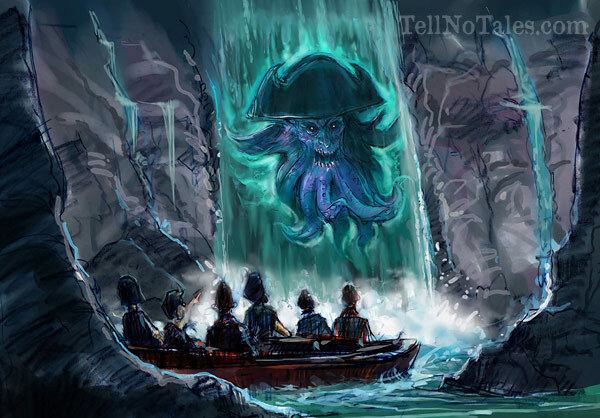 The concept art on this page, provided to TellNoTales.com by Disneyland as an exclusive world-premiere, shows an artist's rendering of Davy Jones appearing to guests in the mist. In a unique twist of events, the concept of Pirates of the Caribbean has come full circle with the attraction initially inspiring the successful film franchise and now the films inspiring additions to the attraction. Both versions of the attraction closed in March 2006 in preparation for the installation of the enhancements that have been made over the past three months. "While the attraction has endured as a favorite for generations, many fans, particularly young kids, may have experienced the movie series before the attraction," said Kathy Rogers, Walt Disney Imagineering senior show producer. "So bringing some of the movies' characters and themes into the attraction helps us maintain that continuity between these wonderfully interconnected worlds." Captain Jack Sparrow appears in the attraction on three different occasions. His first appearance occurs during the familiar "Dunking Scene" where one of the pirate leaders is interrogating the village's mayor, trying to find out Captain Jack's whereabouts by consistently dunking the poor magistrate in the well. Captain Jack Sparrow appears again in a barrel next to a salty old pirate who is reviewing a treasure map. And lastly, Captain Jack can be spotted in the finale of the attraction relishing in his good fortune to be the first to find the town's cache of treasure. Additionally, the treacherous Barbossa can now be seen as the Captain of the Wicked Wench in the attraction's famous battle scene. An apparition of the ghostly Davy Jones, a prominent character in Pirates of the Caribbean: Dead Man's Chest, can be seen in the attraction's mysterious grotto labyrinth, materializing via a fantastic waterfall effect. 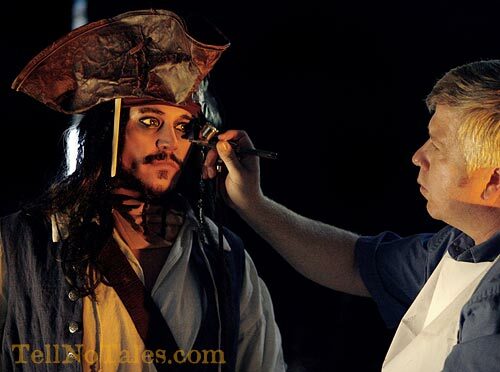 In addition to weaving the characters of Captain Jack Sparrow, Barbossa and Davy Jones into the attraction's storyline, the Disney Imagineers have enhanced the attraction experience with an all-new dynamic digital sound design, the addition of musical cues from the movie soundtracks, enhanced theatrical lighting designs and an improved battle sequence between a pirate galleon and Spanish fortress. 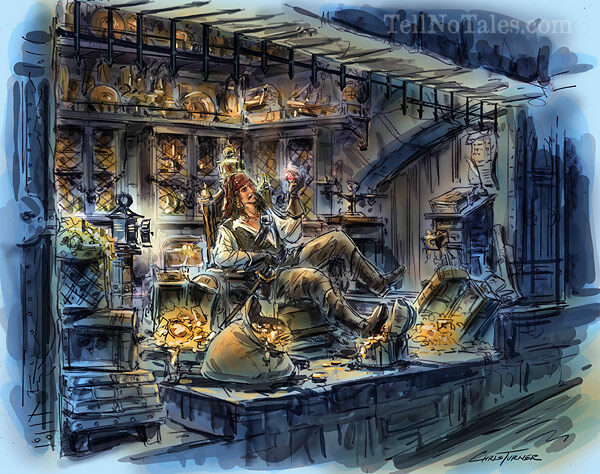 "Captain Jack Sparrow and Barbossa are great new Audio-Animatronics figures, and we've featured them in ways that fit into what's already happening in the attraction but expands the story just enough to include their personalities," added Michael Sprout, WDI senior concept writer. "We want it to feel like they were there all along." One of the largest scene scenes to be enhanced is the impressive "Treasure Cache," found in the attraction's mysterious grottos. Imagineers removed the scene entirely and fabricated more than 400,000 new shimmering gold coins and set pieces. 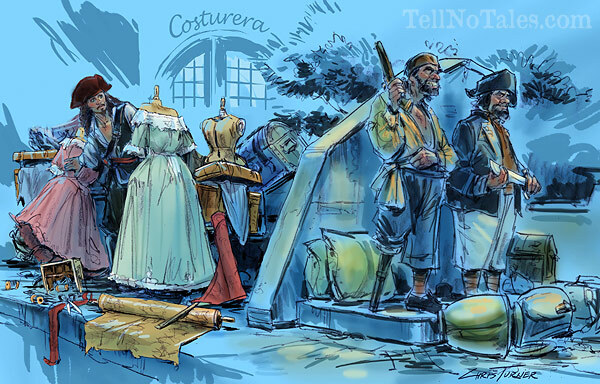 The scene at Disneyland will contain original movie props from the hit 2003 film Pirates of the Caribbean: The Curse of the Black Pearl. "This new chapter in the legacy of Pirates of the Caribbean is testament to our Disney Imagineers, both past and present, who contributed their skills and talents in creating one of the great three-dimensional entertainment experiences of all-time," said Tom Fitzgerald, senior creative executive for Walt Disney Imagineering. "Pirates is considered by many to be the quintessential Disney theme park adventure, and these enhancements ensure its timeless appeal and honored place at Disney Parks around the world." Created under the direct creative supervision of Walt Disney himself, Pirates of the Caribbean is a classic Disney theme park adventure, a swashbuckling voyage that transports guests back to the days when pirates and privateers roamed the Spanish Main. 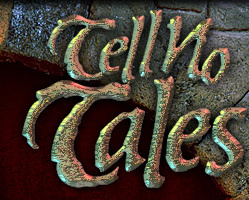 Starring a comical cast of rascals, scoundrels, villains and knaves, the world-famous attraction sends guests of all ages on a voyage through mysterious caverns where "Dead men tell no tales" and then into a colonial era Caribbean seaport under siege by a band of fun-loving pirates. The attraction's jaunty theme song, "Yo Ho (A Pirate's Life for Me)," sets the show's light tone with its tongue-in-cheek depiction of high seas lawlessness now featuring Captain Jack Sparrow, Barbossa and Davy Jones. Featuring more than 120 Audio-Animatronics performers, lavishly decorated sets and special effects, Pirates of the Caribbean is one of the most spectacular attractions ever created for Disney Parks. More than 500 million people have experienced the rollicking fun of the immersive adventure in California and Florida over the past 39 years.